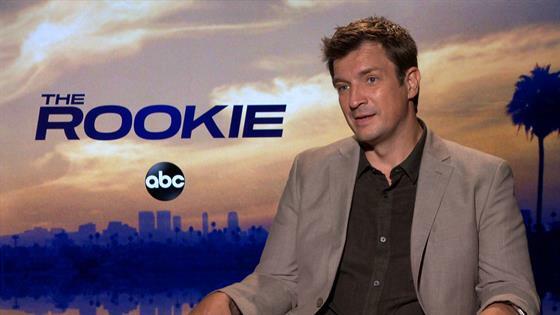 Nathan Fillion Gives 5 Reasons to Watch "The Rookie"
Nathan Fillion is back on the beat. The Castle veteran makes his return to series regular television—and his former network home—in ABC's The Rookie. In the new series, Fillion plays John Nolan, a man who embarks a mid-life crisis-like job change: He becomes a police officer in Los Angeles. Yep, he's the oldest rookie (hence the title). "In an unusual move, I signed on to the show, we pitched it, sold it, then wrote it," Fillion explained about his involvement with the series. "So, for me, it was about just all the right elements." Fillion re-teamed with Castle executive producer Alexi Hawley on the series, but when E! News caught up with Fillion at the 2018 Television Critics Association press tour to discuss his return to TV, he made it clear John Nolan is different than Richard Castle. Sure, Fillion's character has a partner, but this isn't Beckett and Castle 2.0. "An entirely different dynamic," he said. "I've played a lot of characters that have a lot of authority or disregard for authority and kind of do what they want anyway, this is not the case with Nolan. Nolan is, although in a role of authority, he's at the bottom rung of that authority ladder." He's just starting out, but Fillion said his favorite thing about his new character is Nolan's honesty. "I find him to be a very honest and present guy. He's thoughtful. I've played some, kind of, emotionally callus—they seem care free, but actually they're almost inconsiderate…It's nice to play a character who cares a little more," he said. Click play on the video above to hear what Fillion had to say about possibly being mistaken for a cop in real life, plus find out the five reasons he said why you, dear reader and viewer, need to watch his show. The Rookie debuts Tuesday, Oct. 16 at 10 p.m. on ABC.